Is your dog scared of fireworks sounds? Does his demeanor change every time the 4th of July, Guy Fawkes night or New Year’s Eve rolls around? Fireworks phobia is a very common condition among dogs all over the world. The terror that results from the loud booms, whistles and screeches can be an incredibly distressing, debilitating problem not only for dogs, but also for their owners who feel powerless to help. The Canine Noise Phobia Series can help dogs overcome their fear of fireworks, and can also be used to help prevent fireworks phobias from developing in other dogs. The dog first learns to associate positive feelings with the music on the CD. Once he is calm and relaxed, fireworks noises are slowly introduced underneath the music at gradually increasing levels while the owner continues to provide positive experiences. Eventually, the dog is able to function normally during even the most intense fireworks shows. To learn more visit www.CanineNoisePhobia.com. 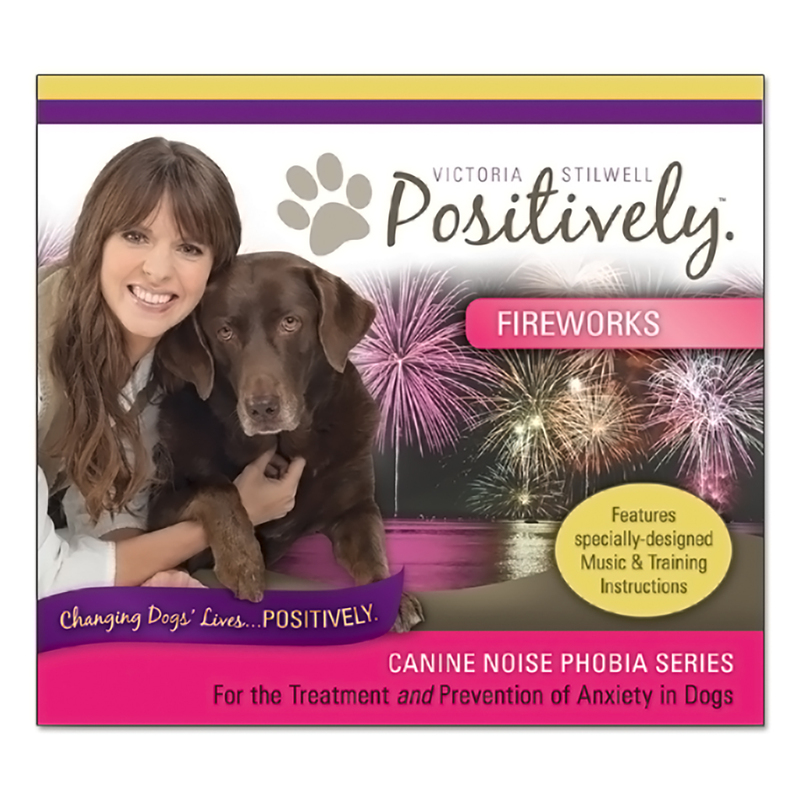 By combining progressive sound effects, the specially-designed psychoacoustic music of, and Victoria’s reward-based reinforcement protocols, the Canine Noise Phobia Series is an innovative new desensitization tool that not only helps reduce the anxiety suffered by noise-sensitive dogs, but also reduces the likelihood of common sound phobias from ever developing. Dogs that have a fear of fireworks often go on to develop a full blown phobia that becomes deeply ingrained and highly resistant to change. Fireworks fear or phobia is very common and is experienced by dogs all over the world, and is especially prevalent during recurring periods of celebration. Dogs of a more sensitive nature or those that suffer with other anxieties are more likely to develop a fear or phobia, and whether this is triggered by a single traumatic episode or prolonged exposure, the result is often distressing for dogs and their people. Without extensive behavioral therapy and management strategies, fears and phobias will become chronic and severely impact a dog’s ability to cope when the fireworks start.